Real men. Real jobs. Taking back control. Watching Manpower two days after the US election, the rhetoric has an especially bitter taste. 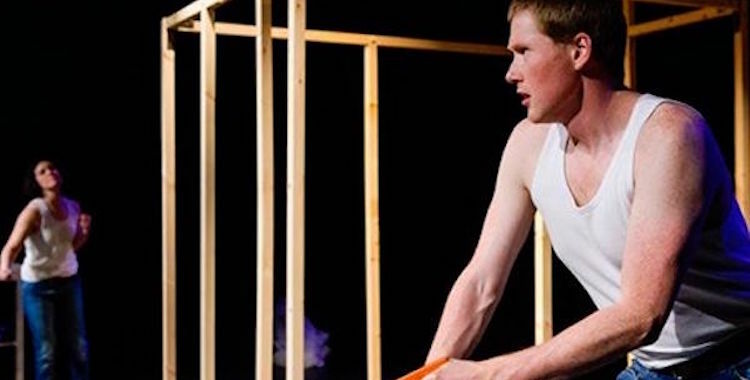 Two Destination Language’s show has the feel of a piece that started being about masculinity and somewhere along the way came to be about Brexit. Watching it now, it inevitably becomes about Donald Trump too. As I write this, the radio is on in the other room and a reporter is talking to Trump voters in the States. People keep saying the same thing. Trump will create jobs. Trump will be good for business. Trump will get our men back to work. Trump will Make America Great Again™. The Brexit vote isn’t the same as the Trump vote, of course, but Manpower is grappling with some of the factors that seem to underlie both. Grappling feels like the right word: Two Destination Language are still in the process of wrestling with these ideas, still working through the consequences of our new political realities. The outcome is unsurprisingly but interestingly flawed. Alister Lownie is a man. Katherina Radeva is a woman. They’re both here to talk to us, in different ways, about work and masculinity. Katherina speaks in the role of outsider, offering us a lecture on our country and its problems over the last 30 years. First the jobs in industry went. Then more men started working in offices, getting soft hands and soft minds. But the real crisis moment for British masculinity arrived with the advent of DIY and B&Q. The only way to feel like a real man anymore was to do a botch job on the new bathroom. But it’s OK: Brexit is here, to help the men take back control. As Katherina takes us on this ironic journey through recent history, to a soundtrack of era-appropriate tracks from Dire Straits and Pulp, Alister is working on his own DIY project behind her. While she talks, he builds, first assembling the wooden skeleton of a shed, then constructing a makeshift wall from the logs scattered across the stage. His masculinity is recovered through the act of erecting a border. At odd moments, meanwhile, the action is punctuated by quiet, dimly lit monologues from Alister: seemingly random interruptions that resolve themselves into subtle blows at political rhetoric. And rhetoric – from politicians, from the tabloid media – is very much the target here. Towards the end of her lecture, Katherina offers us an apology: she might have got a few things wrong, but if she has it’s only because our newspapers can’t make up their minds. It’s hard to know who to believe anymore. There’s a difficulty, though, in the way Two Destination Language have chosen to skewer the narratives that led to the Brexit vote (and, now, to Trump being elected president). Irony, as a political tool, just doesn’t feel equal to the task anymore. It can mock, sure, and it’s undeniably appealing as a performance tactic, but there’s a kind of emptiness to it. In the place of hollow rhetoric, there’s very little it can offer. The show itself even seems to recognise this echoing emptiness. One of Alister’s monologues simply consists of a series of statements, all beginning with “the thing is”. Each is a meaningless cliché, the words drained of all value. The thing is, we’re all in this together. The thing is, there’s no such thing as a free lunch. The implicit question, which Two Language Destination are unable to answer, is how to counter a politics that proclaims to “tell it like it is” while saying anything it needs to in order to win. Neither irony nor apparent sincerity seem to be up to the job. In the very opening speech, as the lights slowly come up, Alister is talking about the importance of investing in good quality sound technology. You can hear the difference, he tells us. At first, it’s unclear where this is going. Why are we being told about hi-fi systems? Then, gradually, the penny drops. You have to do your research, Alister is saying to us. Because that smiling man in the suit, well he’ll just sell you anything. You have to know what you’re listening to. You have to know what choice you’re making. Because more often than not, smiling rhetoric will sell you sounds that end up deafening you.